This morning, I'm flashing back to one of my all favorite posts. I remember the day I shot it - Emma was about 4 months old, it was a Saturday morning (back when I would do all of my work on Saturday!) and Mike and Emma watched me while I set up everything on our old porch in Concord with my favorite blue backdrop and old table. I can't believe that was 4 years ago - it feels like about 10! This cake was made in my 6" Round Cake Pan - which has been restocked, again. You can use this recipe for my Lemon Pound Cake, or you can use a box white cake mix. If you are in the mood for chocolate, leave out the lemon curd layer and make a chocolate cake layered with whip cream and berries. The combinations are endless. I really just like this idea of a casual, rustic layer cake that is perfect in its imperfections - and unbelievably easy. I love assembling desserts. When I'm entertaining, any shortcuts that result in something scrumptious looking and delicious is welcome in my kitchen. I set out to make a trifle... but I somehow have misplaced my trifle bowl. Funny- I don't think I ever actually used it for a trifle before, but I used it all of the time when I was catering as an elevated bowl for salads, dip, fruit, whatever- and now that I actually need it for a trifle, I can't find it. Of course. I think I even had two from the catering days... multiples of everything. Anyway, I really wanted to make an elegant, yet slightly rustic and well, sloppily decadent looking dessert. I decided to make a trifle-looking layer cake with pound cake, lemon curd cream and whipped cream topped with berries. It turned out beautifully. I think. Whip the cream with a whisk attachment until soft peaks form. Add sugar and whip for another 30 seconds. Slice cake into 3 layers with a serrated knife. 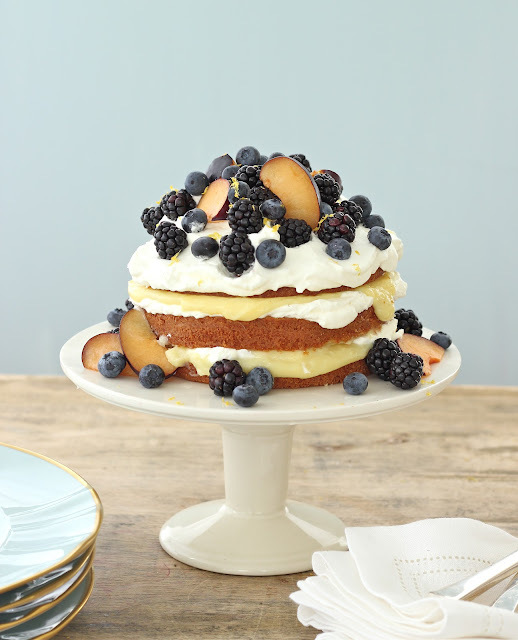 Layer with whipped cream and lemon curd cream between each layer. Top with whipped cream, berries, fruit and lemon zest. I bake my cakes with a piece of parchment cut to the shape of the bottom of my pan. You can easily use a store-bought pound cake for this 'assembled' dessert. I baked mine because I wanted a round cake that would fit on this cake stand. A serrated knife is also known as a bread knife - essential for not tearing up your cake. Put lots of lemon - half of the recipe between each layer! Big dollops of whipped cream - enough to smoosh over the sides. Next layer, please... This is really just silly simple. I think a cake made in a loaf pan - traditional pound cake - would look great, too. Pile it on. The messier the better. Now the pretty fruit. You really can't mess this up - just make it look bountiful, the secret to all great looking food! Just the right thing amongst the dark berries. Isn't she a beauty? Wow. She's messy and pretty at the same time. Can I say wow about my own creation? She looks great, piled high and overflowing, as part of a Mother's Day Spring table setting. My 11 year old just saw this and flipped out. Guess I'm making it soon! And "wow" is a good description. I second that! I loooove it!!! It looks so easy and simple, I can't wait to make one. Oh and I love the yellow lemon touch on the top! Great job! Gorgeous! I love lemon, cream and fresh berries. Looking forward to making this for my mom on Mother's Day :) Thanks for the great post! This looks so good - lemon and blueberries is a favorite combo of mine. Do you have a recipe for the pound cake? I have small cake pans as well and always love a good recipe to use. Far too beautiful to be eaten! Far too delicious to not be eaten. Hmmm... Dilemma.. I love sloppily decadent! I do! although it is because i can't manage a real neat clean-cut cake... But I wouldn't manage your "sloppy decadent" look too! I think this is more than just beautiful! I made this yesterday with angel food cake and strawberries- heavenly!! do you have to eat this right away or can it be made before hand? I have a party tomorrow afternoon and was wondering if it will be okay if I make it today already?? Hi Jenny, I just stumbled upon your blog. Love your creativity. Do you have a search button? I have to scroll through each page to try and find a dish I saw yesterday. Would love to make this on Saturday for my Mother in law's birthday. I don't see the vanilla cake recipe. Can you share or point me to some of your other favorite recipes for such an occasion? Just wondering if you think this cake could be made ahead of time and then put in the freezer for a few days before Easter? I'm thinking about making it as a present for friends and would have to deliver it on Wednesday. Any suggestions? Thanks! My sister has made this a few times for family events... I love it and will definitely have to give it a try sometime this summer.